Today Only! Frankenzombie, Free on Smashwords! Today Only: the Horror/Dark Humor shorts “Frankenzombie” and “I, Stammer (In Disbelief)” are available FOR FREE on Smashword! “Hungry Minds”, an autobiographical tale of school yard bullying, is free every day. Click on the link to go to my profile: to get either “Frankenzombie” or “I, Stammer” for free, look for the coupon codes on their respective pages, and enter them before checkout. They are part of the Summer/Winter promotion on Smashwords which ends today. 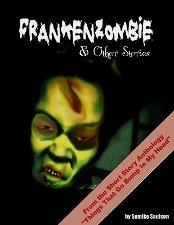 “Frankenzombie” is part of the upcoming horror anthology “Things That Go Bump In My Head”. It will be in Laurel Books in time for Halloween so you can definitely pick up your copy at the “Haunting Laurel Bookstore” event. The book will contain both genre-shorts in the science-fiction and horror style I most commonly write in, and a dramatic pieces like “Hungry Minds”. ~ by Sumiko Saulson on July 31, 2012.